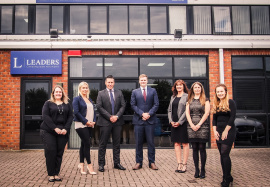 Three weeks after acquiring Bulmer Estates in Nottingham, growing national estate agents Leaders has completed the purchase of the 500+ property portfolio of Derby-based lettings business, MBM Management Limited. The company was established in 1996 and successfully run by founder and owner, Malcolm Blount - who has now retired - along with his daughter Helen Hufton who joined the business in 2000. Helen is very pleased to remain with Leaders where she will continue to manage the portfolio under the Leaders brand. Matthew Light, group acquisitions director at the Leaders Romans Group, says: “MBM is an excellent business with a strong customer-focused ethos that matches our own. We are delighted to welcome Helen and her team to Leaders where we hope they will feel very at home.